Figure 1: Computational design can be used to generate complex and expressive geometries—but when the design process includes environmental analysis, the elements can be optimized to improve performance as well. The building sector is the largest contributor to greenhouse gas emissions, and heating, cooling, and lighting are all major sources of these emissions. The solution? Good passive design can minimize the need for these end uses even while providing enhanced thermal comfort. Passive strategies rely on fundamental decisions such as orientation, massing, and façade design, meaning they require consideration in early design phases. But a business-as-usual approach does not consider performance until later in the design process (if at all). Project teams using a business-as-usual approach will likely fail to meet the increasing energy-efficiency standards required by ever-more-rigorous energy codes—let alone achieve more ambitious environmental performance goals such as LEED certification or net-zero energy. The performance of buildings is a function of the complex and dynamic interactions between climate, site, and occupant behavior as well as the physical and thermal characteristics of the building itself. 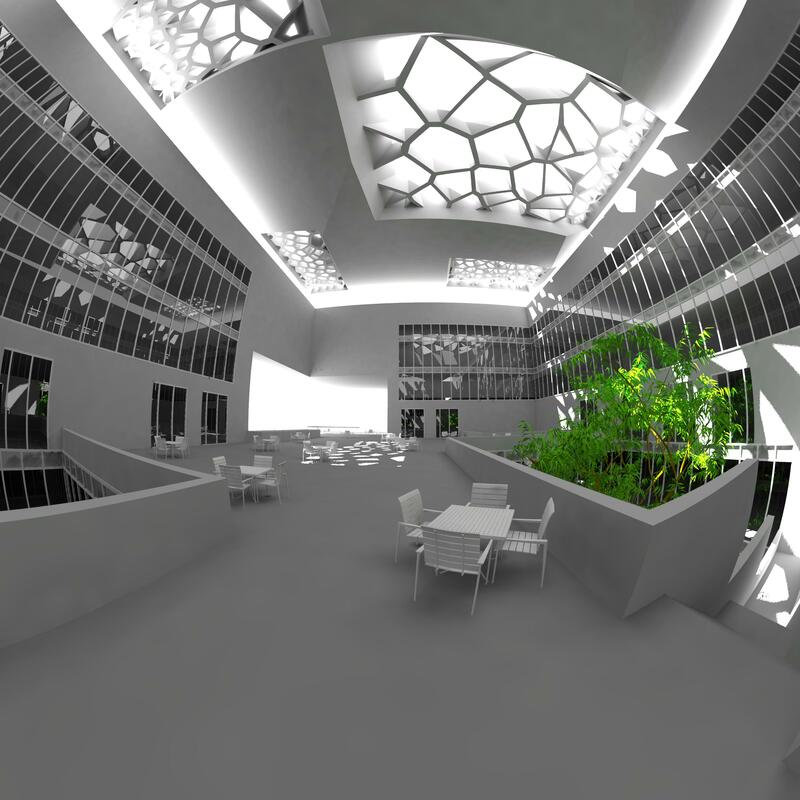 Unfortunately, traditional modeling approaches need the architectural design process to be advanced enough so the characteristics of the building can to be defined in the performance simulation. The catch-22 is that a design that is advanced enough for this traditional modelling approach will have many architectural decisions made already and will therefore be harder to change even if the simulation reveals suboptimal performance. Figure 2: Scripting can be used to parameterize design elements and analyze performance of each combination of variables in an integrated model that simulates multiple performance criteria. The LEED Integrative Process credit aims to address this issue by incentivizing “shoebox” energy modeling at the schematic design phase. A shoebox model utilizes a smaller scale, representative model to study performance characteristics and alternatives without investing the time to construct a whole building energy model. To meet the requirements of the Integrative Process credit, the design team must undertake this shoebox modeling to evaluate ways of reducing loads in the building. Envelope attributes, massing and orientation, lighting levels, and other parameters should be evaluated during this process to identify design solutions that improve efficiency while remaining cost effective. 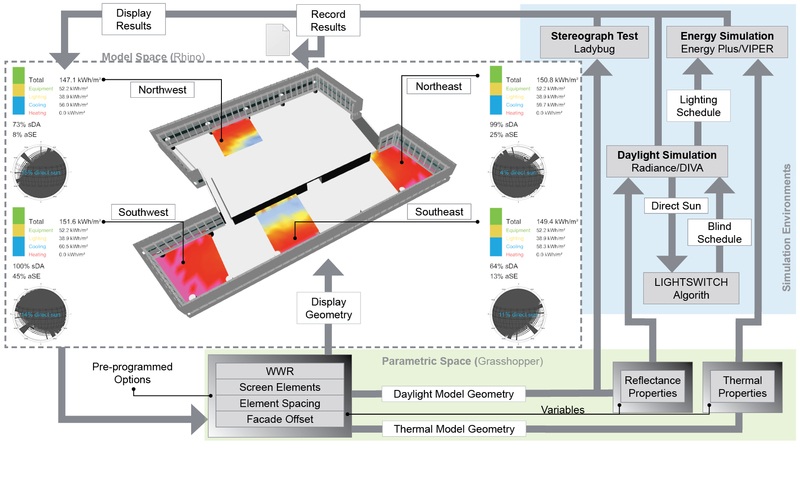 This early-stage performance modeling can be greatly enhanced to yield more integrated and higher-performing architectural solutions by utilizing computer scripting. Computer scripting can provide an enhancement to this early-stage analysis through the parametric exploration of many potential scenarios so that the critical parameters for high-performance can be identified. 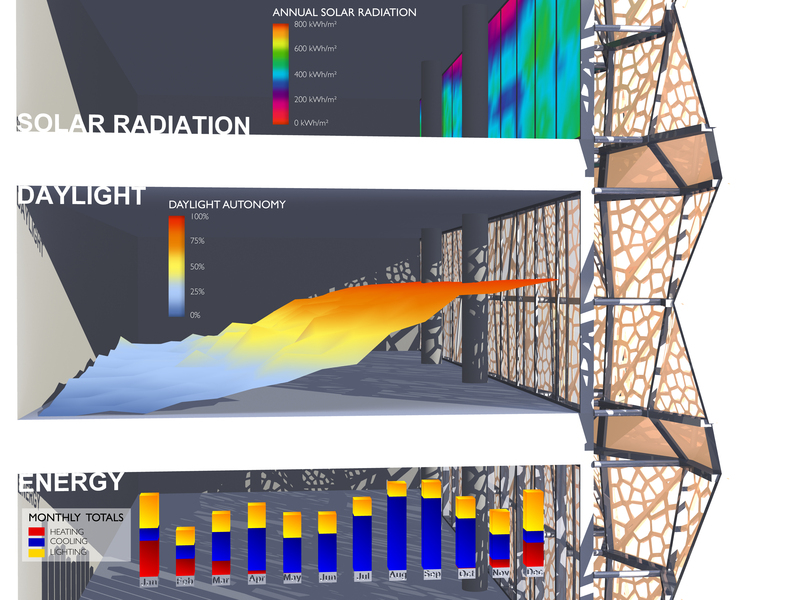 As discussed in our previous post on daylighting and views, the changes to the multitude of variables that make up a performance model are more nimbly and flexibly achieved with computational design, freeing up time to more thoroughly explore a more robust range of alternatives. The comparison of alternatives adds value by helping set priorities and understand potential trade-offs between different design pathways. The studies can provide a data-backed approach to informing fundamental architectural decisions that weigh heavily on passive energy and thermal performance such as orientation, massing, and façade configuration. Figure 3: Studying and visualizing multiple performance criteria simultaneously can provide a better picture of overall performance and identify solutions that work well for all metrics. By providing this information to the architectural and engineering teams earlier in the design process, the modeling process empowers them to make data-driven design decisions that will more likely result in a successful high-performance outcome down the line. The simulations can be set up to simultaneously balance multiple performance considerations such as energy, peak loads, daylight, and visual comfort so that one is not inadvertently optimized for at the expense of the others. Part two of our webinar series, “Change the Script: Using Computational Design for High-Performance Results and LEED,” will focus on how computer scripting has been applied to projects to inform multiple performance criteria during all stages of design development. It will also demonstrate how scripting can tie these performance aspects together to produce design solutions that are well integrated with the architectural design. Computational-design-based processes can help us account for complex environmental factors and generate high-performance solutions to reduce energy consumption and impact on the planet. As the technology and workflows continue to evolve, the range of possibilities is expanding. We want to stir the imagination of the industry to think about how a data-driven, performance-based design process can be used to inform 21st-century architecture and lead to a more sustainable built environment.